Are you looking for new ways to reinforce learning numbers with Montessori math materials? Check out our new Montessori-inspired Math Bead Bar Play Dough Mats Bundle. There's nothing quite like making GIANT Montessori Math Bead Bars! These play dough mats are perfect for encouraging Montessori number and color correspondence. Maria Montessori was brilliant when she assigned each number a color. Once kids master this concept, learning with numbers becomes so easy. They also invite children to work on fine motor skills and muscle strengthening. Just think of little hands at work rolling balls of play dough to create their own Montessori Math Bead Bar. And oh what fun it will be to string them on prepared kabob sticks (if you so choose)! The Montessori-inspired Math Bead Bar Play Dough Mats Bundle is also fantastic for children who learn best using a hands-on approach. It's one thing to use the Montessori Math Bead Bars, but yet another to create them. Little hands will stay so busy. Lastly, these play dough mats are fabulous for children with special needs. Consider a child who's unable to hold the small Montessori Math Beads. What about the child with a vision impairment? I could go on and on and on. These are a must in every classroom, whether at home or school! These play dough mats are so much fun! I love how they provide yet another way to incorporate learning numbers using the Montessori Math Bead Bars. 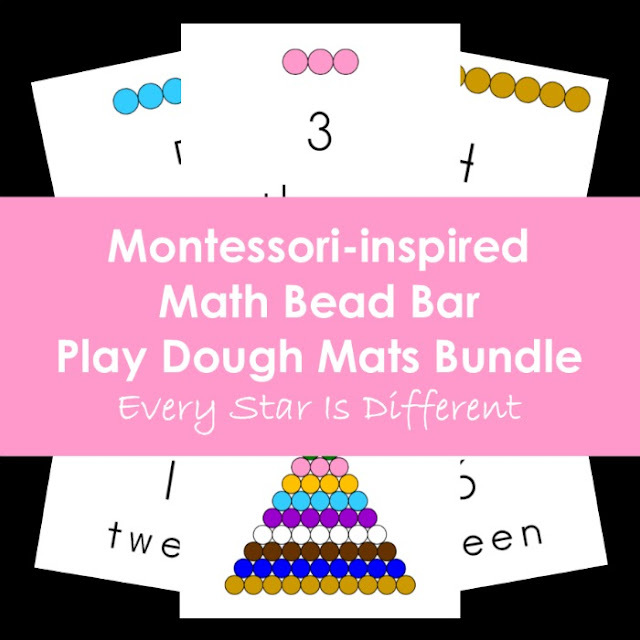 How do you purchase the Montessori-inspired Math Bead Bar Play Dough Mats Bundle?